I’ve always had a penchant for playdough. Possibly more than my children perhaps. Nothing beats that feeling of soft squishy dough as it warms in the palm of your hand releasing that tell-tale scent as you mould it into all kinds of shapes. I love to give sets of it as gifts and this Eco Clay set begs to be given. Passionate about playdough – I told you so. Eco Clay is an aromatic play dough made from all natural ingredients, including certified organic wheat flour, sunflower oil, filtered water, aluminium free salt, citric acid and cream of tartar. Each clay is lightly scented with chamomile, bergamot, ylang ylang, lemongrass, lavender and sweet orange pure essential oils. Doesn’t that sound better than a day at the spa? Each Eco Clay set consists of six colours – yellow, pink, blue, green, purple and orange. 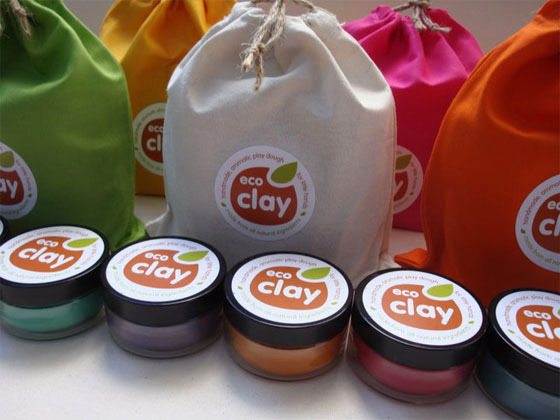 Eco Clay is packed in six recyclable containers and presented in a handy cotton reusuable bag. Eco Clay makes a great gift for the under five-year-old set and is priced at $30 from Eco Toys. Eco Toys deliver right around Australia, so I’m making a note on my Christmas list!